Are you organizing a trip to go somewhere and you need a Trip Planning PDF template? Trip Planning PDF template is like tables that prompt you to take actions according to a set plan. By using this Trip Planning PDF template, you can avoid the confusions while organizing the tour. Trip Planning PDF template has nine different categories that allow you to collect travelers' data such as personal information, destination information like departure date, travel insurance, air travel preferences, cruise preferences, hotel and resort preferences, car rental, international package tours, and other information about hotel and cruise lines quality, future travel interest and enjoying activities. Thank you for allowing the company the opportunity to research a fare for your upcoming trip. We will work to get you the best package available, in your price range. 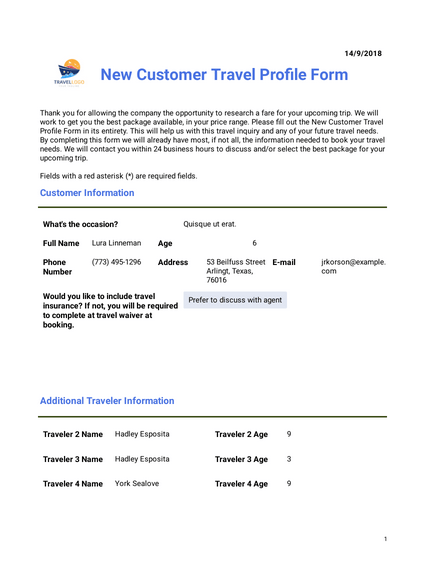 Please fill out the New Customer Travel Profile Form in its entirety. This will help us with this travel inquiry and any of your future travel needs. By completing this form we will already have most, if not all, the information needed to book your travel needs. We will contact you within 24 business hours to discuss and/or select the best package for your upcoming trip. Fields with a red asterisk (*) are required fields. Would you like to include travel insurance? If not, you will be required to complete at travel waiver at booking. What is your city of departure for flights? What is your return date? What is your budget for this trip (per person)? What kind of payment arrangement would you like? Have you received any travel quotes for this itinerary? Will you drive or fly to port of departure? What is your preferred port of departure? What hotels have you stayed in and enjoyed? What cruiselines and resorts have you enjoyed before, if any? List any other notes or comments here. For example, future travel interests, etc. Donec diam neque, vestibulum eget, vulputate ut, ultrices vel, augue. What activities do you enjoy when traveling?